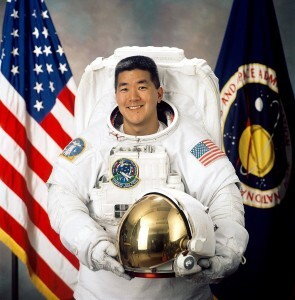 Astronaut Daniel Tani to keynote gala dinner on Sept. 27. Celebrating its 25-year anniversary this year, Go For Broke National Education Center (GFBNEC) will hold its Evening of Aloha Gala Dinner on Saturday, Sept. 27, at The Westin Bonaventure Hotel & Suites in Los Angeles. Reception and silent auction at 5 p.m.; dinner, program, and entertainment at 7 p.m.
As GFBNEC commemorates 25 years of telling the extraordinary story of Nisei World War II vets to teach modern-day students about honor, loyalty and sacrifice, the annual fundraiser will meld the past, present and, most significantly, the future. This year, Irene Hirano Inouye and Steve Morikawa will be serving as co-honorary dinner chairpersons. Inouye is the president of the U.S.-Japan Council and the chair of the Ford Foundation Board of Trustees. She previously served as president and founding chief executive officer of the Japanese American National Museum. Morikawa is assistant vice president for corporate community relations for American Honda Motor Co. Inc. He oversees the company’s philanthropic and community relations programs and corporate image partnerships. The evening’s keynote speaker will be engineer and former NASA astronaut Daniel Tani, who has had an extraordinary career and an incredible story of perseverance. He worked at NASA from 1996 to 2012, flew two missions to the International Space Station, and performed five spacewalks to help repair its solar array, install thermal blankets and replace a solar wing motor. Tani left NASA in August 2012 to become the vice president of mission and cargo operations in the Advanced Programs Group of Orbital Sciences Corporation in Dulles, Va.
Tani epitomizes the “gaman” of Nisei soldiers before him, who through their courage and sacrifice opened the doors for people like him to live their dreams. During a planned four-month mission in space, Tani’s mother unexpectedly passed away. It was a heartbreaking situation no other American astronaut has experienced. And it was made all the more tragic by Tani’s devotion to his mother, Rose, who raised him and his siblings alone in suburban Chicago after their father died when he was 4. Although NASA offered to allow Tani to step away from his assignments, he decided to continue with his mission duties. Tani will share his story and other insights at this year’s gala event. “As Go For Broke National Education Center shares our vision and dreams for the road ahead, who better to embody looking to the future than Daniel Tani?” said Seki. Celebrity chef Roy Yamaguchi (Roy’s Restaurants Worldwide) and local hero chef Akira Hirose (Maison Akira) will once again delight the palates of gala guests. Yamaguchi is Hawaii’s first-ever James Beard Award winner and helped to pioneer the trademark of Hawaii Regional Cuisine. Hirose was named Chef of the Year in 1998 by the Southern California French Chefs Association, and received the Fu Re Ai Award in 2008 from Little Tokyo Service Center, KCET and Union Bank’s Asian Pacific American Heritage “Local Hero” Award in May 2009, and most recently the Pacific Pioneer Award from the Japanese American Cultural and Community Center. To help mark this silver anniversary, the celebrated Evening of Aloha chefs have invited renowned chef Takashi Yagahashi, who specializes in a fusion of French and Asian cuisine, to join them. In 1996, Yagahashi opened his first restaurant, Tribute. The New York Times called it “maybe the best restaurant between New York and Chicago and certainly the finest in Detroit.” In 2003, he received the 13th annual James Beard Foundation Award for Best Chef (Midwest). He opened his namesake restaurant in December 2007. Yagahashi also appeared on “Top Chef Masters” (Season 4) in 2012. GFBNEC will be honoring two meritorious individuals for their contributions to the community and the Japanese American WWW II heroes. David Ono, a co-anchor at ABC7 Eyewitness News in Los Angeles, recently won three Emmy Awards for his documentary “Witness: The Legacy of Heart Mountain,” which chronicles the story of the Wyoming camp where 10,000 Japanese Americans were imprisoned during World War II. Jason Young is a retired Los Angeles Veteran Center advocate and was instrumental in securing VA benefits for Japanese American veterans. Both individuals will receive the Go For Broke Award at the gala. In honor of the 25-year anniversary, American Honda Motor Co. has generously donated a brand new 2014 Honda Accord hybrid touring sedan, to be given to the lucky winner of the drawing to be held that evening. Opportunity drawing tickets are now available by contacting [email protected] or calling (310) 222-5709. Tickets may also be purchased during the event. The winner need not be present to win. Additionally, gala guests can participate in a live auction and an extensive silent auction. Entertainment will be provided by ULU, Kanani Kalama Hula Studio and Grateful Crane Ensemble. Tickets are now available through GFBNEC, with discount tickets being offered to veterans of all wars as well as community organizations. Individual tickets and sponsorship opportunities are available. For more information, email [email protected] or call Ellen Robinson at (818) 242-9108, ext. 204.